May 19 may be World IBD day, but that is no longer the significance that this day holds for me. It was this day in 2015 that I was first admitted to the hospital with an intestinal blockage during the third trimester of my pregnancy. It was the beginning of the end of my pregnancy. Two days before, I had sent out a tweet about feeling a little blocked up. Honestly, at the time I didn’t think it was that big of a deal. It felt like the number of other times I had a mild blockage that would clear on its own if I drank a lot of water and stayed away from fibrous foods. Even when I went to the ER that day, I really only went because I was pregnant. If I hadn’t been worried about my son, I seriously doubt I would have gone to the hospital. It was more about being extra cautious than actually thinking there was a problem. After about a day in the hospital, I already was feeling better. I remember my surgeon coming in to talk to me and telling him I felt great and didn’t see a reason I needed to stay any longer. Little did I know how much worse it would get over the coming days and weeks. Two days after being released from the hospital, I was in tears over the amount of pain I was in and would end up taking myself back to the hospital in the morning. And three weeks after that, my son would be here. For me now, this day is a reminder of how much IBD can impact your life and the lives of the people around you. My pregnancy and my son’s birth did not go as I had planned. Thankfully, everything turned out well in the end, with a healthy baby and a healthy mom, but it could have gone another direction. I know if we decide to have more kids, I will go about things differently in the hopes of preventing another blockage. * But the truth is… with a disease like IBD, you never know what’s going to happen. And that’s why awareness is so important. So people have the information they need in order to make the best decisions. So others understand, even just a little bit, what it’s like to live with an unpredictable disease. And so one day a cure can save others from spending World IBD Day in the emergency room. *This post was written before the birth of the second child and, as anticipated here, my experience was challenging and unpredictable. Although thankfully we ultimately had another healthy baby! This entry was posted in Inflammatory Bowel Disease, Ostomy, Pregnancy, Stolen Colon, Ulcerative Colitis and tagged colectomy, colon, colon bag, Crohn’s disease, health, hospital, IBD, ibd blog, ileostomy, ileostomy bag, ileostomy blog, ostomy bag, ostomy blog, pain, stoma, surgery on May 19, 2016 by Stephanie Hughes. What’s “normal” 4 years after an ostomy? How can 4 years seem so short and so long at the same time? It seems like just yesterday I was scared and feeling horribly sick preparing for this surgery, but at the same time, I almost can’t remember what it was like beforehand. It’s been 4 years… 1461days, to be exact, that I have been living with my ileostomy. The good news is, throughout that entire time, I have never regretted my decision. Yes, I have had times that I resented having to make the decision in the first place, or wished none of this had ever happened to me, but that’s not anything I can change. Based on where my life has brought me and the decisions I was faced with, I am so glad I made the choice that I did. Living with an ostomy is a funny thing. Like anything else, after time you get used to it and you stop thinking about it all of the time. It’s like my phoenix tattoo I have on my forearm. I see this tattoo every single day. It is always right in front of me. Yet, there are many times that it will suddenly catch my attention and I will realize that I haven’t noticed it in a while. It has simply become part of the scenery of my life. I feel the same way about my ostomy. Obviously, I have to deal with it every day, multiple times a day. It’s impossible for me to go a day without me thinking about it at all, yet I still find at times that I have “forgotten” about it for a little while. Or at least I haven’t paid any more attention to it beyond the usual daily maintenance. It, too, has slipped into the background. Obviously it’s not like this every day. I still have times where it very loudly announces its presence in the form of a leak, or itchy skin, or a literal loud noise. But after 4 years, it’s so ingrained into me as part of my normal routine that it often takes something like that to make me pay a little extra attention. And that is what my normal has become. I truly don’t remember what “normal” is—at least normal for the majority of the population. I don’t remember the last time I had a normal poop and I definitely will never have one again. And it’s thoughts like this that still freak me out a little bit. Never. It’s such a big word. It’s so… final. Despite how much of a blessing my ostomy has been and how much it has changed my life for the better, I still struggle with the nevers and forevers. I wonder if I will ever get used to them. I don’t honestly know. Ask me in another 4 or 40 years and maybe I can tell you then, or perhaps I’ll still be wondering. Even so… while it may be difficult imagining the rest of life with an ostomy bag, I will always be thankful for it and how much it has changed my life. The past 4 years have absolutely been some of the best of my life and I am so thankful that my ostomy has allowed me to live it much more fully than I had been previously. So I guess here’s to the next 4 or 40 or 400 years with an ostomy! This entry was posted in Inflammatory Bowel Disease, Ostomy, Stolen Colon, Surgery, Ulcerative Colitis and tagged colectomy, colon, colon bag, Crohn’s disease, health, IBD, ibd blog, ileostomy, ileostomy bag, ileostomy blog, ostomy bag, ostomy blog, stoma, surgery on May 7, 2016 by Stephanie Hughes. It was 4 years ago today when I started The Stolen Colon. At the time, I was dealing with some really severe Crohn’s disease symptoms and I wasn’t even sure yet what I was going to do as far as surgery or treatment or anything. I say I wasn’t sure, but really, I think I knew surgery was inevitable, but I wasn’t able to fully admit that quite yet. (I mean, why else would I call my blog “The Stolen Colon” if I didn’t know what was coming??) I remember after leaving the consult with my surgeon to set up the surgery, I asked him how soon I needed to let him know if I wanted to cancel so as to not mess up his schedule too much. I knew I wasn’t going to cancel, but knowing that I wasn’t 100% committed just yet gave me a little peace of mind. I felt very alone during this time. I felt like no one could understand what I was going through and the decision I was having to make. So I started writing about it. It was partly to help myself process everything, and partly because I didn’t want other people to feel as alone as I did. I had no idea at the time the world it would open up to me. My first post was titled: The blog I didn’t want to write. And that still rings true. I never wanted any of this. 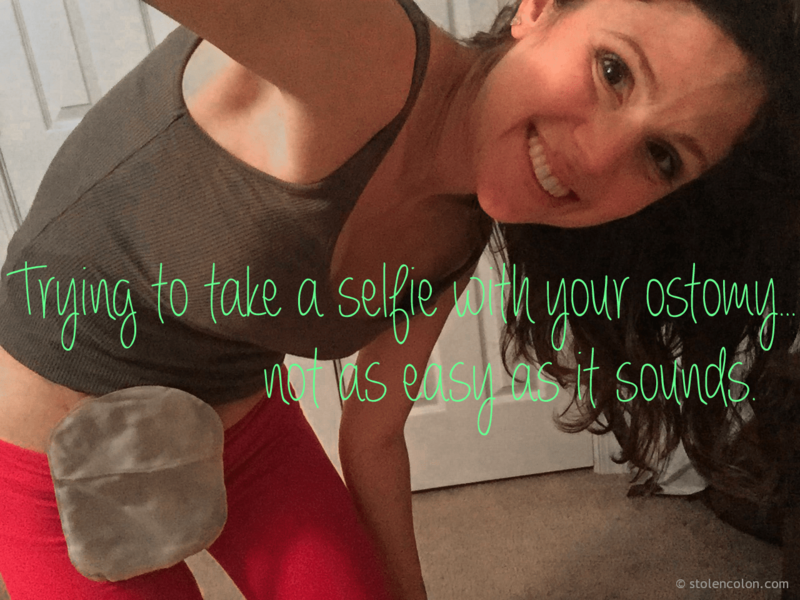 I never wanted to be “that girl who blogs about her ostomy.” But in doing so, I realized how many other people could understand what I was going through and had dealt with the same uncertainties I had. You may also notice that I focused on Crohn’s disease in that first post, because that’s what I knew and what I was already comfortable with. I don’t know that I had much to say about ostomies at the time other than I didn’t want one! It’s amazing to think about how much has changed in just 4 years. By starting The Stolen Colon, I have been given an opportunity to use what I have learned and experienced and help others not feel the same way I did when I was going through with my surgery. I am so happy that there are many more advocates writing and talking today, and there is a much bigger support network for those living with an ostomy. And while I may not have wanted this, I am glad for where starting this blog has led me to today. And I look forward to where it will go from here. This entry was posted in Grad School, Inflammatory Bowel Disease, Stolen Colon and tagged activism, advocacy, blog, colectomy, colon, colon bag, Crohn’s disease, IBD, ibd blog, ileostomy, ileostomy bag, ileostomy blog, ostomy bag, ostomy blog, stoma, surgery on April 24, 2016 by Stephanie Hughes. I have loved seeing all of the ostomy love this week! It’s been great being a part of the sharing of information and spreading of awareness. And it’s not over yet! 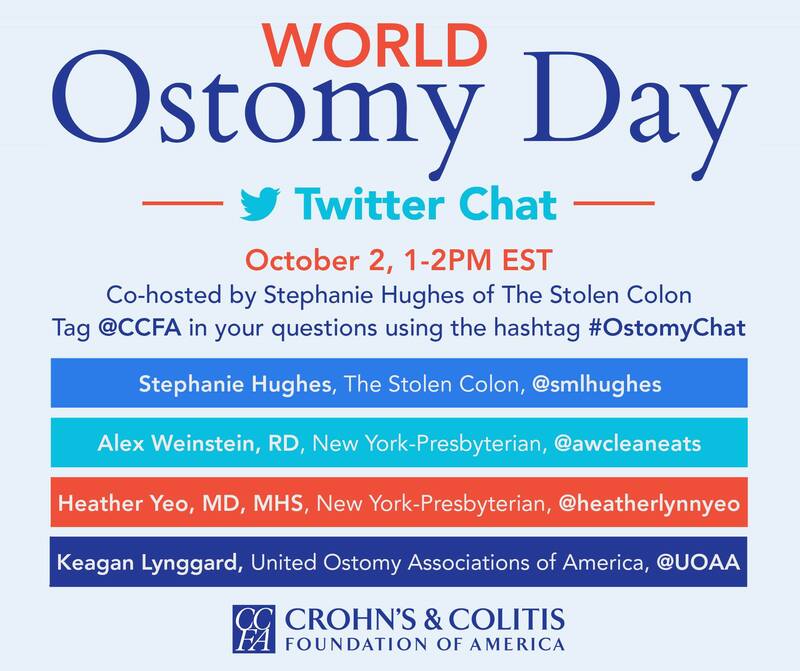 This Friday, October 2, I have the awesome opportunity to co-host a Twitter chat with the CCFA as a precursor to World Ostomy Day. We are going to have a great panel of participants, including a colorectal surgeon, a dietician and representatives from the United Ostomy Association and the Crohn’s and Colitis Foundation. This entry was posted in CCFA, Inflammatory Bowel Disease, Ostomy, Personal, Stolen Colon, Surgery, Ulcerative Colitis and tagged activism, advocacy, colectomy, colon, colon bag, community, Crohn’s disease, health, IBD, ibd blog, ileostomy, ileostomy bag, ileostomy blog, ostomy awareness, ostomy bag, ostomy blog, stoma, surgery, Twitter chat, World Ostomy Day on September 30, 2015 by Stephanie Hughes.